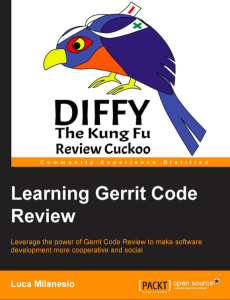 As some of you may know, I’m a huge fan of Gerrit and was involved with enabling it for Eclipse Foundation projects as part of our great Git migration. I also shamelessly support pretty much anything else that embeds JGit. Anyways, I spent some time last weekend going through the book and I found it did a great job introducing Gerrit while taking care of basic setup gotchas. If you’re interested in using Gerrit at the Eclipse Foundation (or else where) and have no idea what the hubbub is about, I highly recommend checking the book out. As an advanced Gerrit user, I found the Appendix sections on working with GitHub (Gerrit supports replication) and integration with Jenkins (or Hudson) well done. As a bonus, I also learned about GerritHub which I had no idea existed. In my opinion, the main downside of the book is that it didn’t cover an advanced Gerrit feature regarding tweaking submit rules with Prolog (which could always use more documentation), however, you can check out the online docs for some solid examples. In the end, it’s always good to support authors who take the time to write about open source technology. Check the book out!